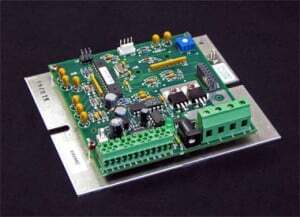 Example Applications: Ideal for electronics enclosures, telecommunications equipment and battery boxes. Features: High cooling capacity in an overall compact size. Narrow 150 mm (5.9″) width. This cooler is powered by 24 VDC and is rated to maintain the enclosure’s NEMA 4 rating. 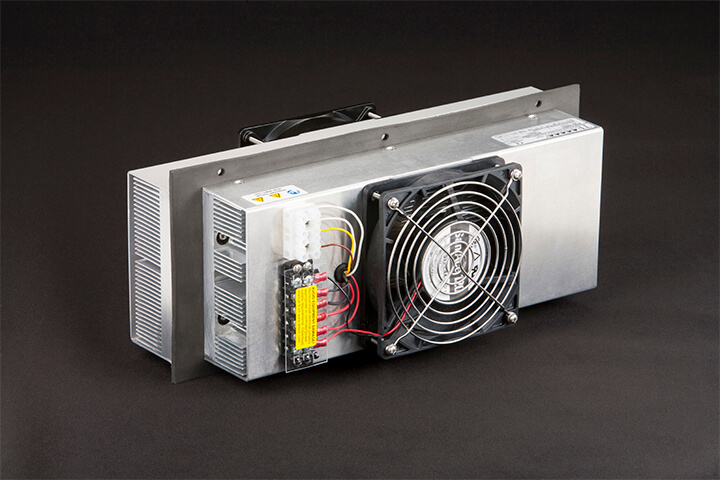 The external-side fan is rated IP-68, it has an anodized heat sink and stainless steel hardware. The AC-220 can be used for heating as well as cooling, and thermostats are included for over-temperature protection. The external fan can be speed controlled for improved efficiency and lower noise. • High Capacity: Removes 215 W of heat in a 35 °C ambient at a 0 °C temperature difference. • Narrow 150 mm (5.9″) overall width. • Protected against harsh environments — meets NEMA 4 and IP68 (external fan) specifications. • Powered by 24 VDC. • Internal fan blows air into the center of the enclosure so cooled air can be aimed at components that need the most cooling. • Cools up to 44 °C below ambient in a 25 °C environment. 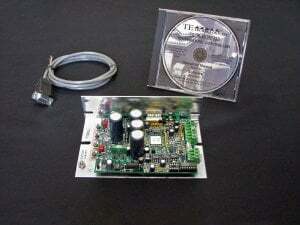 • Over-temperature thermostats included on both fin sets (signal level only). 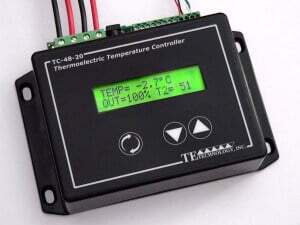 • Operating temperature range is -20°C to +70 °C. • External fan can be speed controlled with the TC-720 temperature controller for improved efficiency and/or reduced noise. 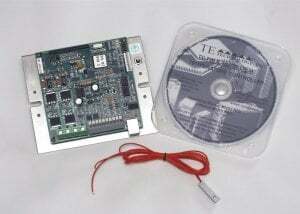 • External fan has a tachometer output signal. 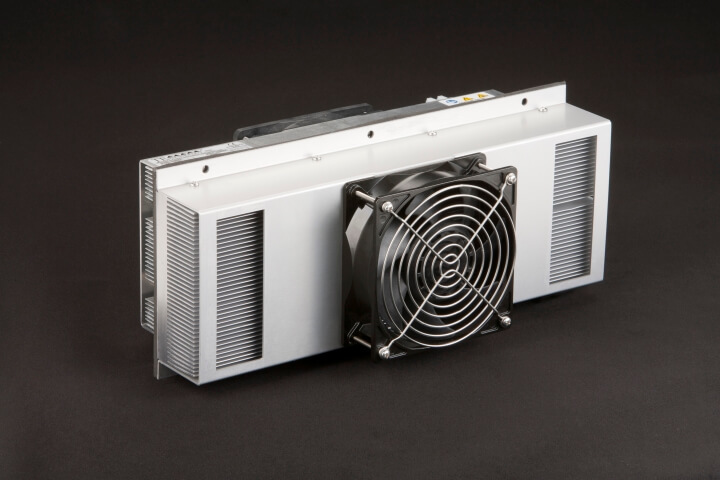 The AC-220 provides high cooling capacity in a narrow 150 mm wide (5.9″) package. The overall dimensions are compact making it easy to get significant cooling capacity in a small space. 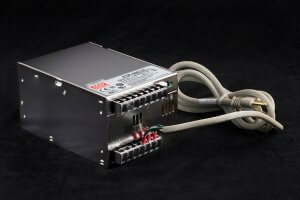 The cooler is powered by 24 VDC and is rated to maintain the enclosure’s NEMA 4 rating. The AC-220 is protected against harsh environments via an anodized external heat sink, stainless steel hardware, and an IP-68 rated external fan. The external fan is also speed controllable and has a tachometer output signal. 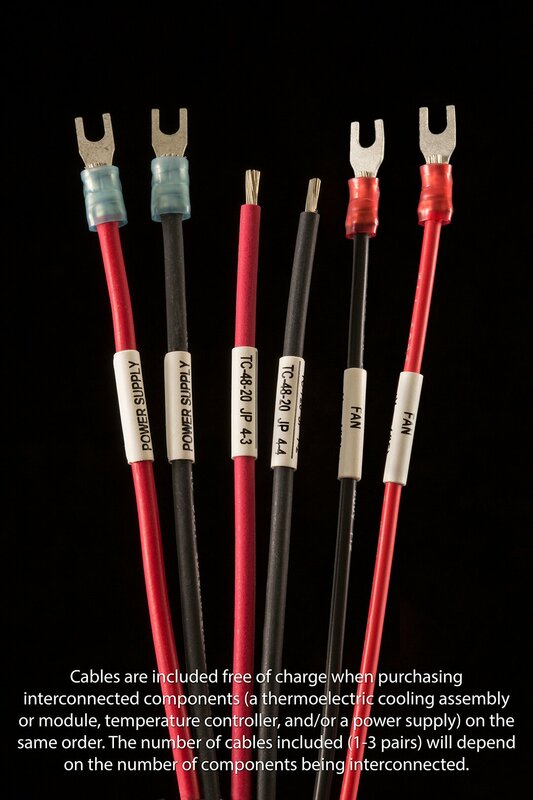 Like all cooling assemblies from TE Technology (and unlike many coolers from competitive companies) the thermoelectric/Peltier elements have our epoxy potting and the assembly is sealed to reduce moisture ingress inside the cooler. The AC-220 can also be used for heating, and two over-temperature thermostats are incorporated in the cooler (one on each set of fins). 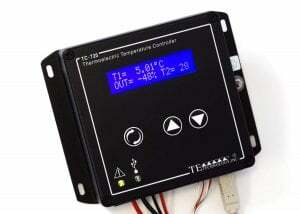 The thermostats are intended to provide a separate means of over-temperature protection for the cooler and equipment and can be monitored via the interlock feature on a TC-720 temperature controller or used to control the output inhibit line on a PS-24-25 power supply. Please note these thermostats are NOT intended as a means of temperature control for the cooler or for direct switching of high-current loads. Finally, as with all TE Technology coolers it can also be customized with other features if production quantities are needed.